A home office is practically a necessity these days. You might use the space to work, create crafts, write or simply stay up to date on news and social media. Whatever you use it for, it’s important to make sure your office allows creativity to flow while providing ample space to work. If you live in the apartments in Glendale, CA, then here are 7 ideas to revamp your office into the ultimate workspace. What spurs your creativity? Is there a particular design scheme that encourages your thoughts to flow and your fingers to type? Whether it’s Mid-Century Modern, Chic, or Industrial, choose your style and revamp your office. Designing an environment that you enjoy and feel comfortable in is a sure-fire way to boost your productivity. Don’t be afraid to go all out in your design, either. Once the muses start flowing, there’s no stopping you. 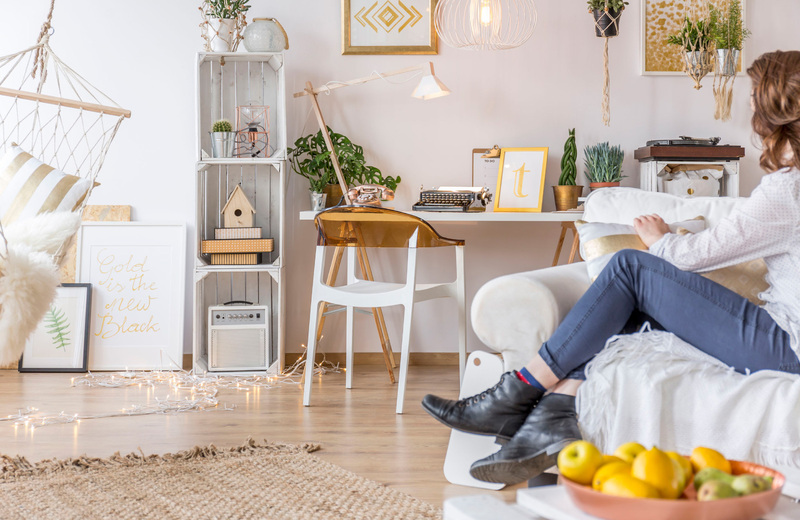 Incorporating plant life into your home office is one way that several renters and homeowners alike spruce up their space. Not only do these green aides keep your indoor air clean, they also provide a sense of calm while adding a living touch to your feng shui. If a green thumb isn’t amongst your many talents, opt for low-maintenance plants. Air, snake, and ZZ plants require very little work to thrive. Money plants, for instance, only need the help of two ice cubes each week to keep growing. With 4-5 plants, you can walk into a refreshing space before starting your tasks. Art has always spurred inspiration in humankind since the dawn of civilization. It triggers the right side of the brain, allowing your imaginative and innovative side to thrive. If you’re used to flexing the left side of your brain for analytical work, then creating that balance can help keep you on track during projects. For those with an already artistic career path or hobby, adding in creative inspiration in the form of a few pieces you like can open up new ideas and help make your space more akin to your work. You can also hang a few pieces of your own if you create art in your home office. Either way, one to three pieces on the wall is guaranteed to keep your creative juices flowing throughout the day. Once you’ve selected a design style, ground your space with a colorful, patterned rug. This adds an extra visual element to your current décor while designating the space as a separate environment. The rug helps your brain identify the space, shifting your mental gears into work mode. Plus, you won’t have to worry about your office chair scratching wooden floors. Have you ever read about the Danish concept of hygge (hoo-ga)? It’s similar to the Dutch idea of gezzelig, with both roughly translating to a cozy, warm, and content life that brings about well-being. it’s important to make your home office a welcoming place where you feel at home, which you can easily achieve with textiles. Blankets, throw pillows, and even natural wood are all excellent ways to make your space as hygge as possible. Don’t go overboard here, though. Make your office too comfy and all you’ll want to do is nap. There’s a rule in the art of feng shui that your desk should never face a wall (among many others). That isn’t always possible when dealing with limited space, however. So, what can you do? Make your wall anything but a wall, of course! The beauty of a wall is that you can decorate it however you like. Hang pictures, artwork, or even a tapestry behind your computer monitor. Changing that dead space into something artistic, creative, and imaginative will help foster hygge while keeping your brain pumping ideas into your work. The number one this you shouldn’t do is rely on artificial light. While you can’t avoid using them on late nights, you can rely on natural lighting during the day. Set your office up in an area with large windows and keep those blinds open as long as possible. Natural light creates an illusion, making any space seem larger than it really is. This is especially helpful if you’re working with a tight space or studio apartment. Regardless, getting a little sunshine each day is excellent for your health and well-being. With spacious floor plans in one, two, and three-bedroom homes, you never have to worry about fitting your home office into a tiny space at Vintage. This contemporary apartment community in Glendale, CA is as much an escape as it a destination. Beautifully appointed homes blend seamlessly with resort style amenities, rolling lawns, parks, and boutique shops to create a distinctly new leisure lifestyle. A collection on indoor and outdoor amenities offer plenty of options for daily pursuits and enjoyment. Take care of business in the Wi-Fi lounge and work center, mingle in the lobby lounge or outdoor social veranda, and host events in the sophisticated resident clubhouse. Relax after a long day of work in the resort pool and spa terrace, or treat your furry friends to pampering in the pet spa. Stay active in the state-of-the-art fitness club, yoga studio, and Pilates studio. With a 30,000 square foot retail plaza included, everything you need is right outside your front door. Each home at Vintage features the finest in modern finishes. Quartz countertops accentuate modern cabinetry, fixtures, and lighting. Walk-in closets, balconies, and full-sized stacked washers and dryers provide the comforts of home. Features like dedicated resident and guest parking make life a little easier, while design elements like wood-style flooring create an envious appeal.